In all corners of the world. Supreme Master Ching Hai, as She has affectionately become known to those who have had the pleasure to meet or work with Her, lives a message that walks the way of love. A renowned humanitarian, artist and spiritual visionary, Her love and assistance have extended beyond all cultural and racial boundaries to millions of people around the world, including the needy and homeless, institutions of medical research on AIDS and cancer, war veterans of the United States of America, the disadvantaged elderly, the physically and mentally handicapped, refugees, and victims of natural disasters such as earthquakes, floods, and fires. Through these works, we witness countless reminders of compassion, which is the trademark of this caring lady and the international organization that has grown out of Her loving example. Supreme Master Ching Hai once said:"Whatever we can share, we begin with sharing. Then we'll feel a subtle change within ourselves - more love will be pouring into our consciousness, and that is the beginning. We are here to learn, to learn to grow as well as to learn to use our power, our limitless power of love and creativity, to make the world a better place wherever we happen to be." Supreme Master Ching Hai was born in central Au Lac. During Her early years, She was often found providing help and comfort to hospital patients and the needy. Above all, a burning spiritual quest since childhood lead Her to different paths of God devotion. As a young adult, She moved to Europe to study and continued there as a volunteer nurse and translator for the Red Cross. She soon discovered that pain and suffering exist in all cultures and in all corners of the globe, and Her search for the remedy for these ills became all the more the foremost goal in Her life. She was happily married at the time to a German doctor, and although it was an extremely difficult decision for both of them, Her husband agreed to a separation. She then embarked on a journey in search of spiritual understanding. Finally, in the deepest reaches of the Himalayas in India, She found an enlightened Master who imparted to Her the Quan Yin Method, a meditation technique that contemplates on the inner light and sound. After a period of practice, She became fully enlightened. Soon after Her return from the Himalayas, at the earnest requests of those around Her, Master Ching Hai began sharing the Quan Yin Method, encouraging others to look within to find their own greatness. People from all walks of life found that through the Quan Yin Method of meditation, they attained greater fulfillment, happiness, and peace in their daily lives. Before long, invitations arrived from the United States, Europe, Asia, and South America as well as the United Nations, beseeching Master Ching Hai to present public lectures in their countries. As well as being a noble example of humanitarian aid, Master Ching Hai also encourages people to beautify the world we live in. Through meditating with the Quan Yin Method, Master Ching Hai has realized many latent talents that She expresses through artistic paintings and creations, music and poetry, and aesthetic jewelry and dress designs. These works of art depict the inner and outer beauty of the cultures and peoples She has met. In 1995, by public demand, Her clothing creations were exhibited on the international fashion circuit, including London, Paris, Milan, and New York. Sales from Her artistic endeavors have enabled Master Ching Hai to create an independent source of funding for humanitarian activities, highlighting Her noble love for all children of God and our responsibility to those who are less fortunate than we are. 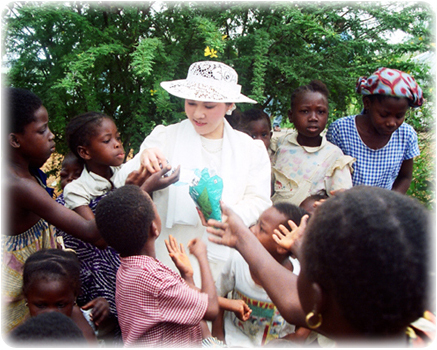 Although She does not seek acknowledgment of any kind，in recognition of Her selfless assistance, Supreme Master Ching Hai has received numerous awards from government officials and private organizations around the world, including: The World Peace Award, The World Spiritual Leadership Award, Award for Promotion of Human Rights, the World Citizen Humanitarian Award, and the Award for Outstanding Public Service to Humankind. (Mayor Fasi): "She brings love around the world where there is hate. She brings hope where is despair. And, She brings understanding where there is misunderstanding. She is the light of a great person, an angel of mercy for all of us." Supreme Master Ching Hai is one of the truly dedicated people of this era, helping others find and create a beautiful vision of the future. Many great people in history have had dreams, and in Her own words, so does Supreme Master Ching Hai: "I dream that the whole world will become peaceful. I dream that all the killing will stop. I dream that all the children will walk in peace and harmony. I dream that all the nations will shake hands with each other, protect each other and help each other. I dream that our beautiful planet will not be destroyed. It took billions of years to produce this planet and it's so beautiful, so wonderful; I dream it will continue, but in peace, beauty, and love."